Matamela Cyril Ramaphosa was born on 17 November 1952 in Johannesburg. His family was moved from Western Native Township to Soweto in 1962, where he attended Tshilidzi Primary School. He completed high school at Mphaphuli High School in Sibasa, Venda in 1971. He registered to study law at the University of the North in 1972, where he became involved in student politics, joining the South African Student Organisation (SASO) and the Black People’s Convention (BPC). He was detained in solitary confinement for 11 months in 1974 under Section 6 of the Terrorism Act for organising pro-Frelimo rallies. He was detained for the second time and held for six months in 1976 following the Soweto student uprising. While a law clerk for a Johannesburg firm of attorneys, he continued his studies through the University of South Africa (UNISA) obtaining his B. Proc degree in 1981. He then joined the Council of Unions of South Africa (CUSA) as a legal advisor. In 1982, at the request of the Council of Unions of South Africa (CUSA) he founded the National Union of Mineworkers (NUM) with James Motlatsi and Elijah Barayi, and became the union’s first General Secretary. He was instrumental in building NUM into the most powerful union at the time, with membership rising from 6 000 to 300 000 during his tenure. He led mineworkers in one of the biggest strikes in South Africa’s history in 1987. As NUM General Secretary he was instrumental in the establishment of the Congress of South African Trade Unions (COSATU), and played a prominent role in the Mass Democratic Movement (MDM) when COSATU joined forces with the United Democratic Front (UDF) against the apartheid government. He went into hiding in July 1986 after the declaration of a state of emergency. He was later appointed chairperson of the Reception Committee to receive Rivonia trialists and in January 1990 accompanied released ANC political prisoners to Lusaka, Zambia. He served as chairperson of the National Reception Committee, which coordinated arrangements for the release of Nelson Mandela and subsequent welcome rallies within South Africa. Following the unbanning of the ANC, in 1991 he was elected ANC Secretary General at its first national conference in over 30 years. He became head of the ANC’s negotiation team at the Convention for a Democratic South Africa (CODESA) and the subsequent multi-party talks. Following South Africa’s first democratic elections on 27 April 1994, he became a Member of Parliament and was elected as Chairperson of the Constitutional Assembly. In that position, he was responsible for overseeing the drafting of South Africa’s internationally acclaimed first democratic Constitution. In 2009, this contribution was recognised with the award of the National Order of the Baobab in Silver. On completion of the Constitution drafting process, he left Parliament and his position as ANC Secretary General to move into business, joining New Africa Investments Limited. In 2001, he established Shanduka Group as a black-owned investment holding company, building up a diverse portfolio of listed and unlisted assets. In 2004, he established the Shanduka Foundation, focusing on education and small business development. The Foundation, which has since changed its name to Cyril Ramaphosa Foundation, comprises Adopt-a-School Foundation, Black Umbrellas and the Cyril Ramaphosa Education Trust. He is co-chairperson of the Advisory Board of the Kagiso Shanduka Trust, which is in partnership with the Free State Department of Education on a programme to develop schools in the province. He gained a wide range of business experience serving on the boards of some of Shanduka’s investee companies and other companies. He was a member of the United Nations Global Leadership Group that advised the Secretary General’s Special Representative on Business and Human Rights. He has received several awards. He was awarded the Olof Palme prize in October 1987 in Stockholm. In October 1991 he was a visiting Professor of Law at Stanford University in the United States. He has received honorary doctorates from the University of Natal, the University of Port Elizabeth, the University of Cape Town, the University of the North, the University of Lesotho, the University of Venda and the University of Massachusetts (USA). He is currently the Chancellor of the University of Mpumalanga. He was the first Deputy Chairman of the Commonwealth Business Council. He was Vice Chairman of the Global Business Coalition on HIV/AIDS. Mr Ramaphosa was appointed, along with former Finnish President Maarti Ahtisaari, as a weapons inspector in Northern Ireland. He also sat on the International Commission of Intervention and State Sovereignty and the UN Secretary General’s Panel on International Support to NEPAD. He was appointed Deputy Chairperson of the National Planning Commission in 2010, a body created to draft a long-term national development plan for South Africa. In December 2012, he was elected ANC Deputy President at the ANC’s 53rd National Conference in Mangaung. He was appointed Deputy President of the Republic of South Africa on 25 May 2014. In December 2017, he was elected 13th ANC President at the 54th National Conference in Johannesburg. 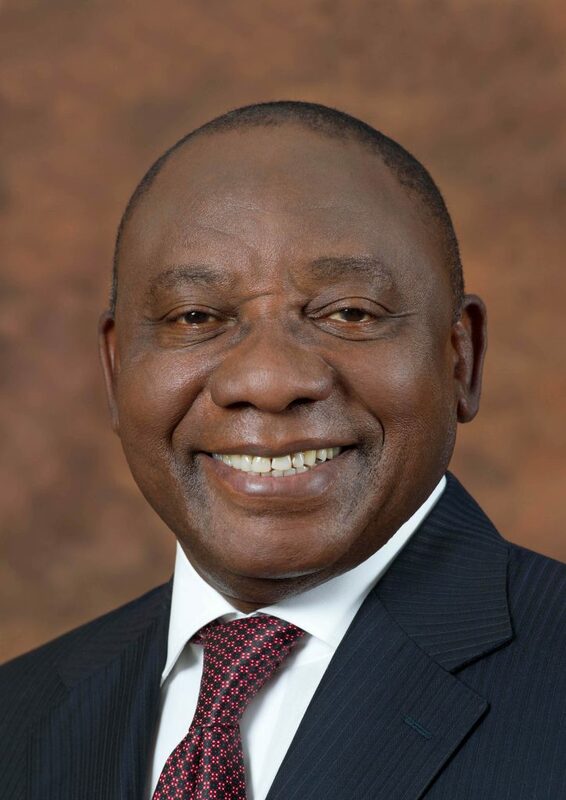 President Cyril Ramaphosa was sworn in as President of the Republic of South Africa on Thursday 15 February 2018 following the resignation of President Jacob Zuma. 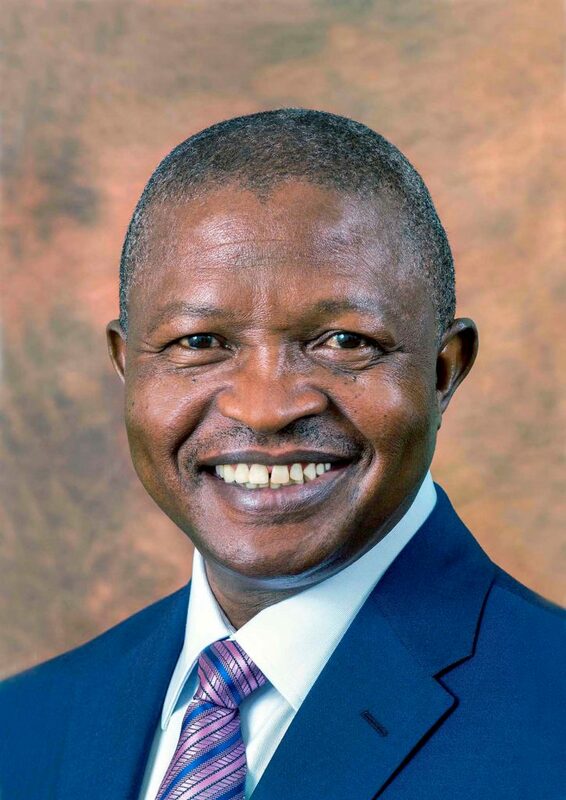 Deputy President Mabuza was born at Phola Trust, Mpumalanga Province, on 25 August 1960. He obtained a Bachelor of Arts Degree in Psychology from the University of South Africa in 1989, following his achievement of a National Teacher’s Certificate from Mgwenya College of Education in 1985. He was sworn in as Deputy President of the Republic of South Africa on Tuesday, 27 February 2018, following his appointment to this role by President Cyril Ramaphosa. • Special Envoy to South Sudan. Mr Mabuza’s career started as a Teacher and Principal before moving to politics. His passion still remains in education. He established the DD Mabuza Foundation in 2014, focusing on education and the social upliftment of vulnerable groups such as child headed households, aged and persons with physical disability.